Jennifer Skomial is obsessed with teaching, and she has been since the first grade. Skomial’s brother wasn’t her only practice student. Her enthusiasm for education came at a cost to the children she babysat in high school. Skomial says that from the time she was a little girl she idolized her teachers. They, in turn, encouraged her obsession with school, offering her cast-off textbooks and extra handouts to take home. While Skomial knew she wanted to be a teacher, she didn’t love math or science. So her seventh-grade language arts teacher, Ms. Toma, inspired her to pursue language arts. Skomial and her husband, Chris, both attended Morris County School of Technology in Denville. Chris studied carpentry and Skomial was in the Child Related Careers program, but it was not until after Skomial finished college that they connected. The couple now have three daughters, Bradyn, 5, Kendall, 3, and Taylor, 7 months. 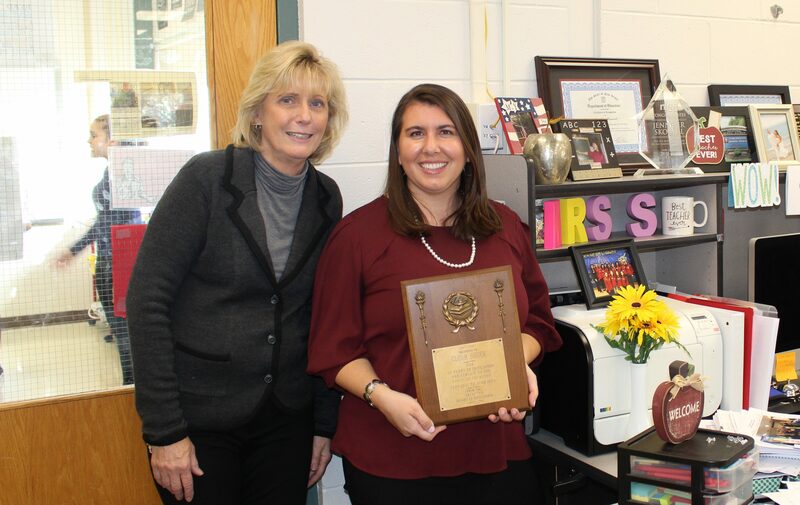 Skomial was on her last day before starting her maternity leave when she learned she had been named the Morris County Teacher of the Year. Now that Skomial’s children have started school, she is enjoying the parent perspective of education. She’s been a student and a teacher, but parenting is something else entirely. Bradyn recently started learning sight words and is excited to see those words on street signs while riding in the car. “Being on this side of education is eye-opening and is giving me a different perspective that I can share with my students. I even misplaced a packet of work once and could not believe that I had become ‘that’ parent!” Skomial laughs. Skomial began her career in education at Costley Middle School in East Orange. From September through December 2007, she was a student teacher but in January 2008, she was hired full-time in the district as a language arts teacher. Skomial works closely with lead preschool teacher, Nancy Kucinski (l). Careers in education run in Skomial’s family. Here she holds the plaque her grandmother received after a 26-year career in education. In September 2008, Skomial moved over to the Morris County School of Technology. She started out as an English teacher for ninth through 11th grades. Skomial loved being back at her alma mater but reading her students’ essays opened up a new career path for her. That dream became a reality when her former teacher and the Child Related Careers instructor Jean Constantine approached Skomial to discuss her retirement. Constantine felt that Skomial would be a wonderful replacement, but Skomial had just started a family and was concerned that the timing might not be right. She needn’t have worried. All the pieces fell into place and, beginning in 2013, Skomial began teaching the program that she had attended in high school. “I love teaching no matter what, but teaching future educators is just a dream for me,” Skomial says. Morris County School of Technology students select from among 14 academy programs. There is an application process, and 16 new students are selected each year to enter the Academy for Education and Learning program. Skomial is so enthusiastic about the program that her two older daughters have both attended the preschool class that her students teach. 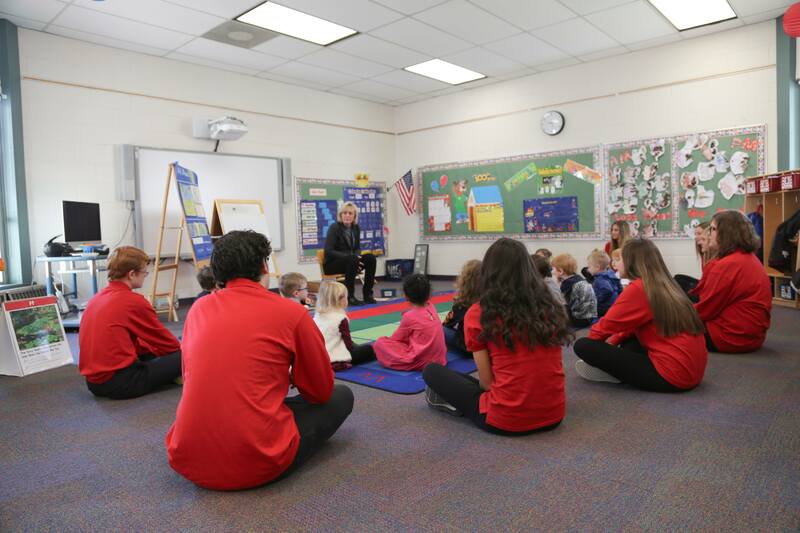 During their freshman year, students learn about the teaching profession, daily routines in an early childhood setting, lesson planning and classroom management. In addition, they begin teaching lessons in the preschool class, which is an integral part of the program. During their sophomore year, students learn about child development, barriers to learning and tools for assessment. Near the end of school year, the focus is on the essentials for attaining employment, which is a unit that helps students prepare for getting their first jobs. 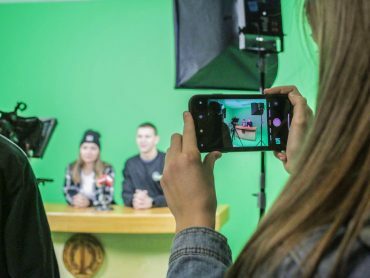 In that unit, students also learn more about how to market themselves for their intended career path through the creation of a digital portfolio. The students start teaching right away. They must prepare lesson plans, understand the standards and be aware of early childhood development and best practices for learning. 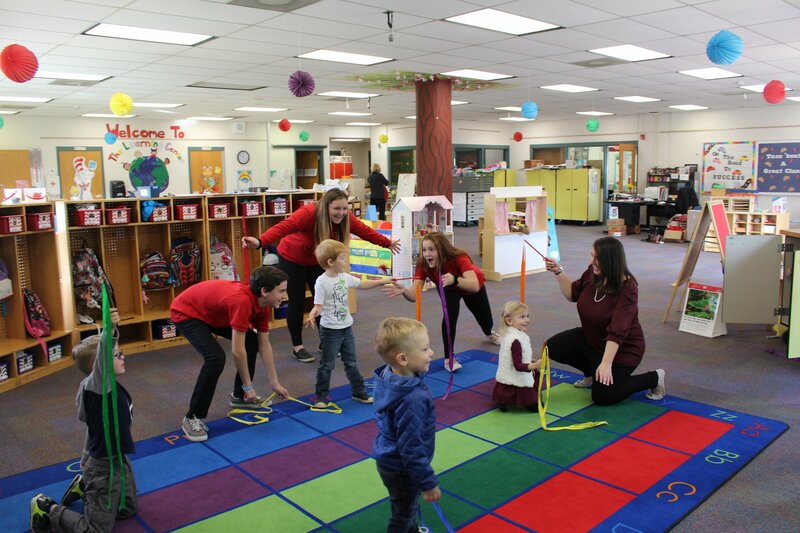 Every other day, Skomial’s students work with the two preschool classes, a morning class and an afternoon class, during four rotations. At any given moment, four students are teaching the preschool class, four are observing the teaching and learning, four are working on lesson plans, and the remaining four are studying educational theory either through independent activities or collaborative projects. Skomial and her students work closely with the lead teacher in the preschool, Nancy Kucinski, to ensure that the prekindergarten students are learning in a safe environment that takes their developmental needs into account. Lead preschool teacher Nancy Kucinski demonstrates a lesson. By their junior year, students have gained the confidence and completed the foundational preparation to begin teaching in pairs or on their own. Typically, they’re excited about the opportunity to teach the class of about 15 preschoolers without much assistance from their peers. During this time, they also focus on instructional strategies for secondary classrooms and there is a strong focus on diverse learners. 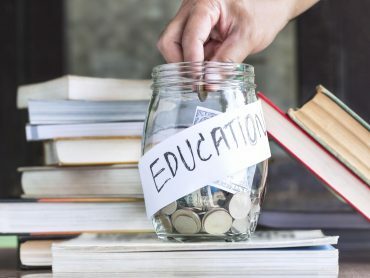 Students also learn about the historical foundations of American education and the certification process for educators in New Jersey so that they can begin selecting a college major that fits their career goals. Near the end of junior year, students begin preparing for their senior year field experiences. During their senior year, students in the program take classes through the County College of Morris or another area college and complete a 120-hour internship that Skomial coordinates. Students are placed in various education environments, according to their career interests. This year, some students are in elementary and middle school settings depending on their grade level and subject area preference, some are placed with speech pathologists at a school for children with developmental disabilities, and others are placed in more specialized settings. Skomial monitors the internships and ensures the experience meets the needs and abilities of her students. The seniors come in for monthly “staff meetings” to discuss what they’re experiencing at their internship sites and to continue collaborating with one another. Skomial also works with her students on the college application process and connects them with additional experiences outside of their internships. Throughout the year, Skomial introduces many guest speakers to give students an idea of the breadth of careers in education and child development. Some speakers return year after year, but many are new faces that have been suggested by students. Skomial notes that not all the students in the program want to become classroom teachers. Skomial’s classes are almost three hours long, so she and her students spend a lot of time together. This provides Skomial with many opportunities to offer genuine guidance and support to her students. 2018-19 State Teacher of the Year Jennifer Skomial (right) and several Morris County School of Technology students with children from the school’s preschool program. Directly in front of Skomial is her daughter, who is part of the program. 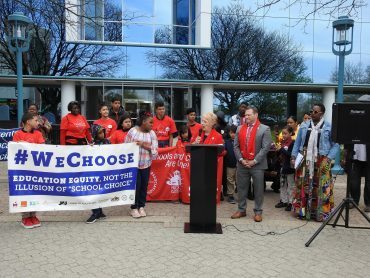 As the New Jersey Teacher of the Year, Skomial will have a six-month sabbatical to tour the state and work with the New Jersey Department of Education. ETS, one of the sponsors of the state’s Teacher of the Year program, covers her salary and benefits. ETS also provides her with a new laptop computer. NJEA is also a sponsor of the program. It will provide Skomial with a rental car, equipped with EZ Pass, to help her travel to speaking engagements and meetings across the state. NJEA also will provide complimentary access to all major NJEA workshops and training opportunities, a $500 clothing allowance, media training and communications support, and funding for a trip to Washington, D.C. to meet with the other state teachers of the year and the president of the United States. Skomial now has ambitious plans for her sabbatical. “I want to explore what preservice teacher preparation is like at other high schools that offer it,” Skomial says. “I’m interested in finding ways to attract more students into this field, especially from areas where we need more diverse teachers. I also want to talk to principals about what they’re seeing from students who go through traditional and alternate route teacher preparation programs, and what teachers feel needs to be emphasized. This will be an amazing opportunity to network with educators who might come and speak to my students about their careers. Going forward, Skomial is hopeful that she will be able to use her platform to create opportunities for those who coordinate teacher preparation programs for middle and high school students to get together twice a year to share ideas and make program decisions.